Just a typical November morning on the Bedford L platform. 2 Comments on Reader Contribution Du Jour: Surf’s Up! Maybe he’s coming back from shopping at that pickle store on Orchard Street on the Lower East Side. I think this was the week they were having their Genetically Modified Sidewalk Sale. 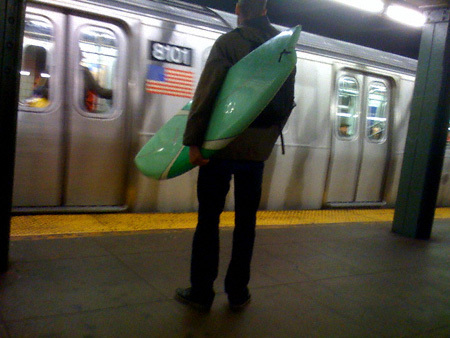 There are quite a few of us who take the L to the A to surf. Especially this past week as the Nor’Easter made for really great waves.